Yellowstone’s Grizzlies Are Losing Key Protections, Will Their Comeback Endure? After over 40 years of protection under the Endangered Species Act (ESA), grizzly bears around Yellowstone Park will no longer receive federal protection. The Department of the Interior justified its decision by citing the rise in the number of grizzly bears over the past few decades, hailing the Greater Yellowstone grizzly (GYG) as one of America’s greatest conservation stories. But wildlife groups have vowed to challenge the ruling in court, voicing concern that without continued protection, the gains made for the the GYG over the past few years will be lost. Although the U.S. Fish and Wildlife Service (USFWS) claims that its decision is based on sound science, not everyone is celebrating the delisting of the GYG. And, as with a previous attempts by the USFWS to remove species from the ESA, the recent ruling will almost certainly be challenged in court. We’ve seen a big spike in mortality in the last few years as more and more bears get into contact with people. “The Service has an obligation under the Endangered Species Act to rationally evaluate whether the grizzly population remains threatened by virtually any manmade or natural factor, and in this case there is a combination of things still threatening the bears,” explained Tim Preso, an attorney for the environmental law firm Earthjustice. Preso said Earthjustice is most concerned about the bears’ changing diet; as many of the trees and vegetation that the GYG has traditionally relied on have been affected by pests and climate change, the bears have turned to a more meat-based diet, which puts them at higher risk of human interaction. “When they’re eating meat, they’re down in the valley bottom where the deer and the elk and the other critters hang out…but also where people are hunting in the fall, and the result is that we’ve seen a big spike in mortality in the last few years as more and more bears get into contact with people,” explained Preso. The data speaks for itself; according to the U.S. Geological Survey, about 60 grizzlies were killed in the Greater Yellowstone Ecosystem in 2015 and 2016, double the number of bears killed in 2013 and 2014. Preso said that Earthjustice is closely examining the final ruling put out by the USFWS to determine what course of action, if any, it will take. Earthjustice is far from the only party concerned with the area’s grizzly bears. Dozens of Native American tribes and related associations have signed the Grizzly Treaty, opposing the delisting on the grounds of respecting the sanctity the grizzly bears and their importance as a keystone species. Other organizations, like the Endangered Species Coalition, have come out against the ruling because they believe that states aren’t ready to take up the mantle of grizzly conservation. Grizzly bears were first protected by the ESA in 1975 after surveys showed that their habitat was shrinking at alarming rates. At the time, just five or six distinct populations remained across the entire lower 48 states, with a total of less than 1,000 bears. The southernmost of these populations was the GYG, which was comprised of less than 150 individuals; the GYG population had shrunk steadily as more people moved into the area, and hunters increasingly targeted bears. But under the protection of the ESA, it was now illegal for a private citizen to harm or kill a grizzly, giving the bears of Yellowstone some much needed breathing room. Although the bears continued to face pressures from increased contact with humans, they were no longer targeted by hunters, and the population began to bounce back. This isn’t the first time the USFWS has claimed that the GYG has recovered and should be taken off the Endangered List. In 2007, citing the bears increased population size and a slew of other factors, the agency stripped the GYG of its protection under the ESA. However, soon after the decision was finalized conservation groups filed lawsuits challenging the ruling, arguing that USFWS hadn’t taken into account the recent decline in the area’s whitebark pine trees, a key food for grizzly bears. 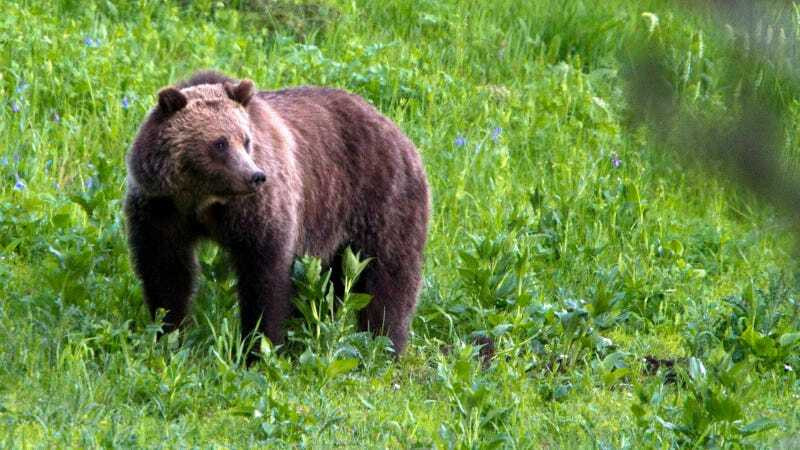 After reviewing the evidence, a federal court ordered the USFWS to rescind its decision until it had conducted another analysis which factored in the effects of declining food sources for the grizzlies. The USFWS returned to the drawing board to reevaluate the status of Yellowstone’s grizzly bears. Then last year, under the Obama administration, the USFWS proposed delisting grizzly bears once again. Writing at the time, the USFWS touted that the GYG was “one of America’s great conservation successes,” and no longer needed the protection of the ESA. The administration faced considerable backlash over its proposal, and hadn’t taken any formal movement to delist the Yellowstone’s grizzlies, until last week when the Department of Interior announced that it was moving forward with the delisting. While the GYG is on track to lose its protection under the ESA, there will still be safety mechanism in place to make sure that the bear population remains viable. “The ESA requires that the Service, in cooperation with the states, monitor the recovered species for a minimum of five years in order to assess the population’s ability to sustain itself without the ESA’s protective measures,” explained Mogadem. “If at any time, threats to the population change or unforeseen events change the status of the population, then it may be relisted.” More specifically, if GYG numbers fall below 600, the USFWS will take direct action to reduce pressure on the population. Also the protection of bears inside Yellowstone will not change, as the park will continue to follow their bear management plan and prohibit hunting. If at any time, threats to the population change or unforeseen events change the status of the population, then it may be relisted. However, the surrounding states will get to decide for themselves whether grizzly hunting will be permitted outside the park boundaries. While states have yet to put out an official comment, it seems likely that there will be at least some level of hunting taking place; and seeing as bears often roam outside park boundaries in search of food, there will likely be Yellowstone bears that are casualties of next legal grizzly hunt. In the brief period of time that the bears were delisted in 2007, 30 bears were hunted and killed in the surrounding states.